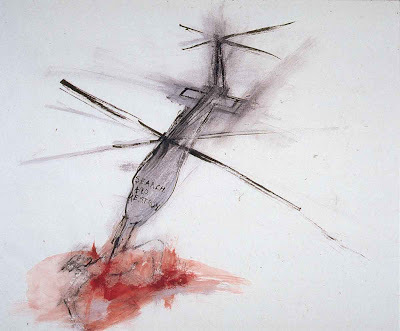 You can come to the work of Nancy Spero, shown here at Paris's Centre Pompidou in a posthumous retrospective with all sorts of biographical and ideological preconceptions. 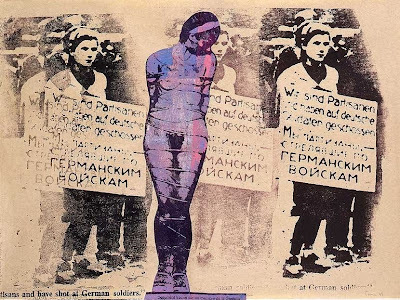 It's an enormous credit to an artist so easily identified with the pop-art, feminism, ant-war protest and all sorts of counter cultural reference that the visual and physical presence of Spero's work can stand outside and above the biography, theory and reportage and leave one quivering. 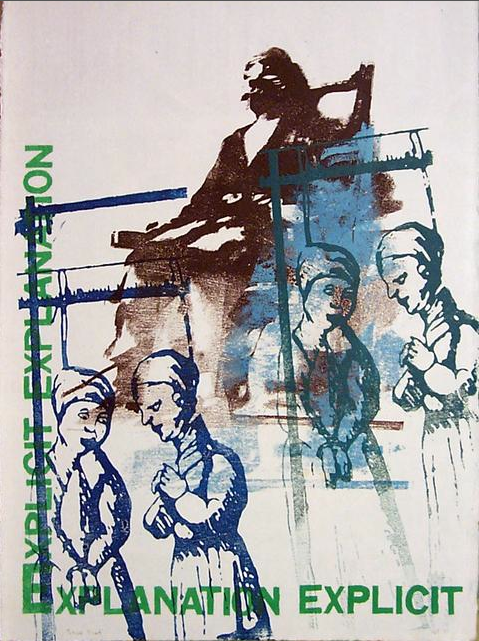 The work here spans almost fifty years, from dark washes of ink on paper in the late 1950's to encyclopaedic serigraphs created prior to Spero's death in 2009. There's a range of work here, mainly on paper, here spanning drawings, watercolours and prints, surrealism, abstraction, classical quotation, graphical and typography but throughout it is positively charged with a recognisable and common energy of line and colour. Everywhere you see the way that marks seem to have been made on the paper, in a kinetic blur or a with a slap of pigment but with an urgent assertion. It's this visual energy that makes Spero's urgent commitment far more than a lecture in ink and paint. The earliest works here are dark monochrome smears, where people and words emerge in dark from an off white paper. In small drawings the figures might be the marks of features on a shroud or shadows seared into the walls of Pompeii. 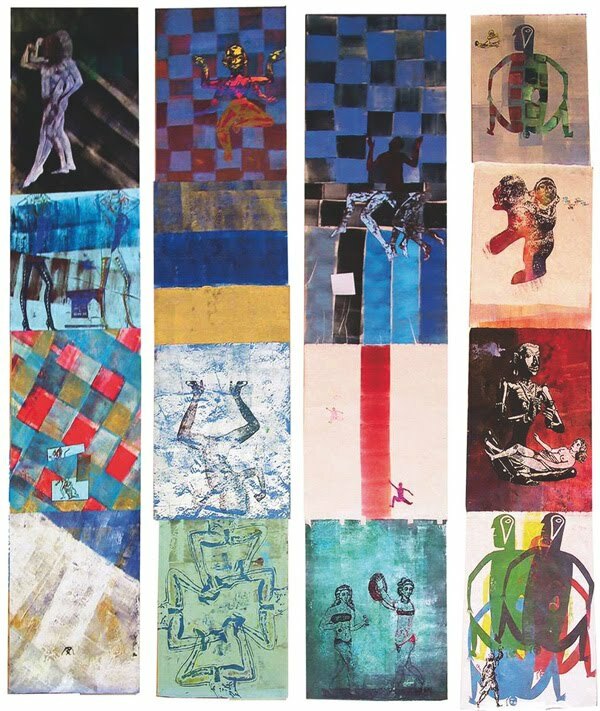 With a minimum of ink these lithographs look like memories, the men or women are isolated shapes on the paper that have been reduced down to the characteristics of totems. Across the same room and within four years the dark ink has filled the frame and figures seem to contort out of black smoke almost in the shapes of Blake's Job. Whether having figures pushing out of smoggy backgrounds or using a minimum of marks on the blank paper the common Spero characteristic is economy. Less happens than you might think, she just seems to make every stroke matter. 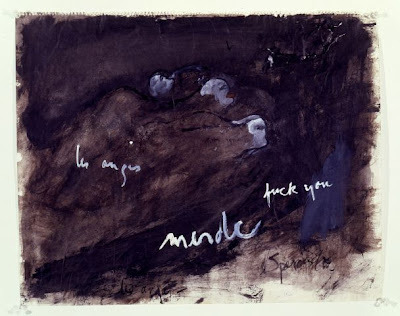 Part of the brilliance of this show is that is demonstrates how Spero takes on new stimulus, the media coverage of the Vietnam war or the poetry of Antonin Artaud, without ever losing her essential visual signature. The war pictures bring in harsh arbitrary shapes like the cross blades of the helicopter and we see human figures chewed and stripped to the bone, smeared with violent colour. People are tossed and ripped as if in rough Guernicas, twisted from the inside out and left motionless on piss-yellow washed backgrounds. Spero shows figures as if they were broken toy soldiers or the faceless repeated victims of conquest on triumphal Egyptian wall paintings. 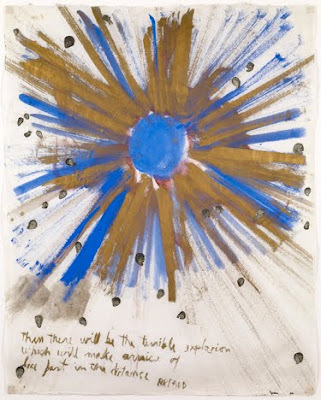 As she brings in these influences her economy of mark remains and adds to the impact of the paintings, the restraint prevents her from making war the spectacle that she abhors. The war paintings also include explosive surrealist portraits of single figures that can remind you of Francis Bacon's contortions of Louise Bourgeois's genital surreality. 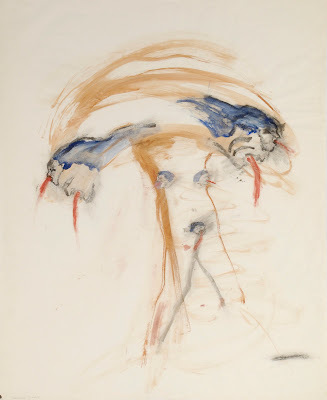 Here Spero creates figures that might be Sumerian or Inca, disembodies heads that turn into sexual organs. Mouths spew blood and colour slashes and swirls and the overall effect are a series of aborted angels of death. Oddly at the end they remind you of Goya more than Spero's contemporaries. To be honest these pieces are far more effective than the text based works here. Slogans, no matter how you cut them up, lack the depth of great art. It's in these pieces is the most obviously a 'political' artist but they have the least ability to make us re-evaluate how we feel or to challenge us to action. The problem is a common one, politically motivated art tends to repeat a dogma and in doing so it loses the ability to connect in a human way. The biggest work here, wrapped in three lines of large prints around three walls,'Azur', is a delirious archaeological montage. The individual images are like photocopies of artefacts, changing and degrading or the charcoal rubbings made of medieval funereal brasses, immediately they look like obsessive replication. But the lines of prints start to look like a fast cinematic montage and the juxtapositions and repetitions ask a question for every one they answer. It's not exactly analytical, but it looks like messy unresolved thought, the mind using images to wrestle with an idea. Intentionally or not they bring to mind patchwork quilts as much as radical collage. The colours are flashes almost like filters and throughout it is as if Spero has been playing with the combinations that visual culture offers us, cheesecake women come in cold blues while ancient sculpture pulses in technicolour. The persistence of the technique reminds us of its craft just as the quilt does, but it also suggests that nothing is fixed, that re-evaluation is an imperative and that we must question and question and question what we see. The repeated printed image makes for visual poetry and punnery too. 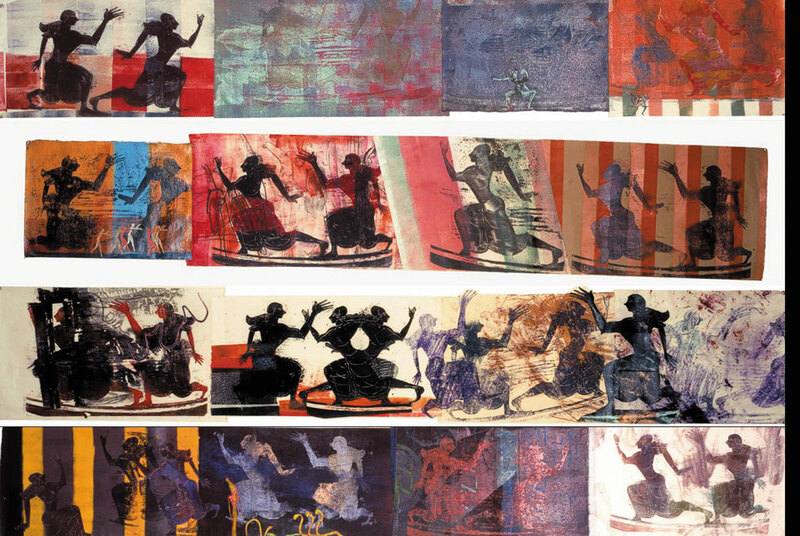 In 'Relay' Spero takes a classical Greek image of a woman running and repeats it, inverts it, reverses it, overlays it with colour and scratching and swathing it with colour. The effect (reminding us of the circularity of painting around a vase) is something both glorious and futile. This woman crosses colour and time, passing on something without ever reaching a finishing line. Ambiguity gives the piece depth but also helps show us how Spero's wok can be committed and ideological whilst still retaining an essential humanity and empathy. The answer to centuries of women not controlling the representation of their own image is for women to ceaselessly make images, not to simply state the issue and sit back in ideological smugness. Thats sense of vital imperative makes these works feel essential and timely. Certain pieces of art come loaded with layers of reference, historical borrowings that weigh down the work and put the viewer in their place. It is as if we are being told "If you understand all of these things you might just be worthy to pass judgement on me". Others works tap into the vein of memory that pulses through our culture using the images that transmit and translate our shared experience, letting them bring their deep currents and seismic presence without hectoring the viewer with erudition. Spero's best work (and that's most of it_ transcends agit-prop and simple conceptual posturing. Wit and anger and movement and ambiguity make these works personally political and implicate the viewer. Feminism in art needs urgent powerful voices but too often gender studies ideology breeds sterile jargon (as does any ideology) and forgets that blood and skin and breath and tears and doubt and death are universal and that great art starts with there. Nancy Spero knew that and it's that heartbeat that survives her so wonderfully.